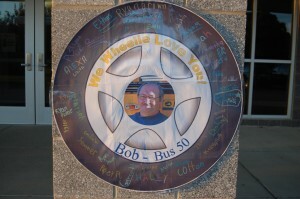 Penn Manor School District this week is honoring the people entrusted with transporting thousands of students nearly 5,000 miles every school day – its 75 bus drivers. As part of Bus Driver Appreciation Week, parents of elementary students greeted drivers with thank-you cards and small craft items in appreciation. Other drivers received gift bags or breakfast on the go. 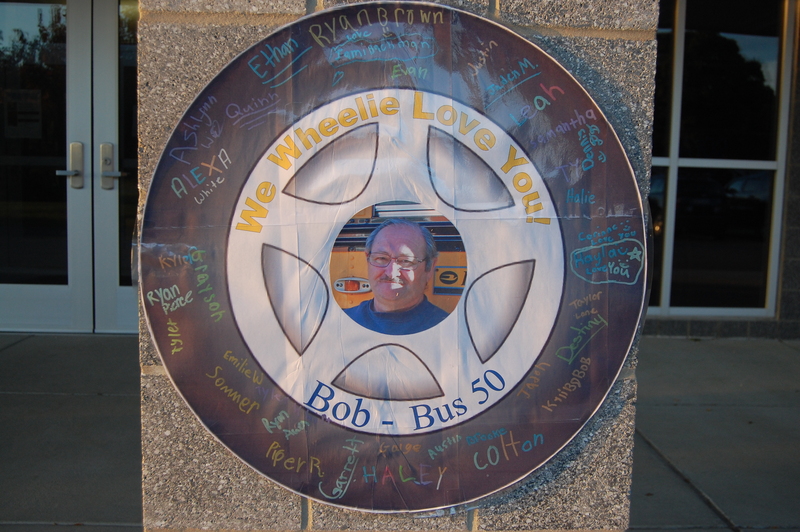 At Martic Elementary, students signed images of wheels, with each driver’s photo in the middle, declaring “We wheelie love you.” Similar tributes and activities will continue throughout the week. According to Finegan, the district has 75 drivers and 67 buses that travel an average of 4,969 miles a day. The two longest-tenured drivers are Donald Harnish, with 42 years of service, and Ella Sensenig, with 34 years. Pictured in the photo receiving a gift bag from superintendent Michael Leichliter is bus driver Kelly Ditzler. The other photo depicts a poster displayed at Martic Elementary School. Thank you, drivers, for all you do!